Croagh Patrick, or 'The Reek’, as it is known locally, is situated 9 km west of Westport on the Louisburgh road, above the village of Murrisk. It is one of Mayo's most famous landmarks, soaring to a height of 765 metres. The mountain overlooks Clew Bay and the entire western coastline and is particularly associated with Ireland's patron saint, St Patrick. It was originally called Cruachan Aigli. Cruachan means conical mountain, while Aigli means eagle and indicated the overall area too. Croagh Patrick is the Holy Mountain for Irish people, where, according to traditions and accounts, in 441 AD St Patrick spent the 40 days of Lent praying and fasting on the mountain top as part of his effort to convert Ireland to Christianity, following the example of Christ and Moses. Here, St Patrick is credited with driving snakes, demons and magicians out of Ireland, hurling them into the Demon’s Hollow or Log na nDeamhan, a lake at the north base of Croagh Patrick. It is said it burst up because of St Patrick’s powerful gesture. Since then it has been focus for pilgrimage and nowadays thousands of people still climb the Holy Mountain on the last Sunday of July or “Reek Sunday”, some of them stopping at the Stations of the Reek, walking around or kneeling at the stone cairn and praying. The Stations evolved over the centuries. Nowadays there are three stations. The first station takes place at the Statue of St. Patrick, a few hundred metres up the mountains. Traditionally it took place at Leach Benin (Benin’s stove or grave) named after Benin, one of St. Patrick’s disciples. The second is located on top of the mountain at Leaba Phádrag (Patrick’s Bed). The third one is located at the foot of the Holy Mountain on its western shoulder and is known as Reilig Mhuire (Our Lady’s Cemetery). The 19th century writer William Thackeray in his travel book, “The Irish Sketch Book” (1842), described the site as ‘three stone heaps’. Today we know the three stone heaps actually are Bronze Age cairns or burial sites. Masses are celebrated throughout the day in the little church on the summit which was built by 12 local men on the summit in 1905 using local stone and cement brought up the mountain by donkeys. The building contractor was Walter Heneghan of Louisburgh. It is said around 10,000 people attended the dedication ceremony. On that day the Midland and Great Western Railway Company scheduled special trains for the ceremony. Peter MacConville’s brass band played at the dedication. Until 1973 the pilgrimage used to take place at night. 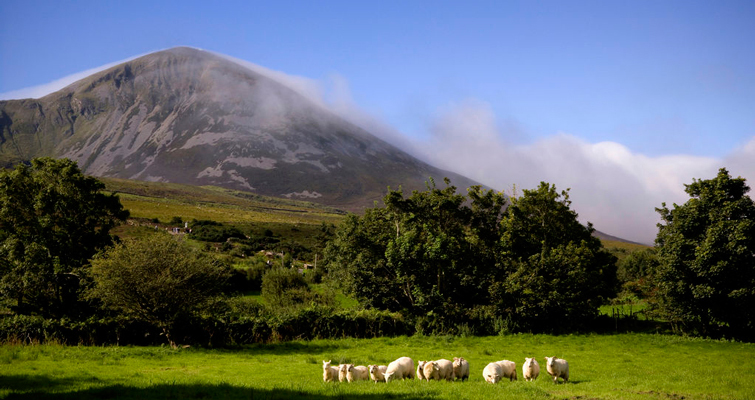 Traditionally locals climb Croagh Patrick on the last Friday of July or “Garland Friday”. In addition, Croagh Patrick has reputedly been a site of pagan pilgrimage since 3000 BC, linking the “holiness” of Croagh Patrick to Pagan traditions. The festival of Lughnasa in honour of Lugh (an ancient pagan god of the Tuatha De Dann) was turned into the Domhnach na Cruaiche or Reek Sunday according new Christian beliefs. A recent archaeological survey uncovered an impressive range of ancient sites on the summit and around the mountain including fulachta fiadh (Neolithic cooking sites), megalithic tombs, standing stones, ring forts, stone ramparts and dwellings. Some amber, blue and black beads dating back to 3rd century BC were found. More than 30 hut sites and the foundations of an early Christian oratory were discovered on the mountain slopes. The Black Bell of St Patrick or the “Clog Dubh”, now in the National Museum in Dublin, was a highly venerated relic on Croagh Patrick for many years. It was made from iron and dates from 600 to 900 AD. It belonged to the Geraghty family, near Ballinrobe, as Sir William Wilde stated in one of his book (1867). Every year, on Reek Sunday, the family used to bring the bell on the top of the Holy Mountain, where pilgrims were allowed to kiss it for a penny or two pennies if affected by rheumatism pains. According tradition, the bell was white, but became black because it was used as a weapon against the demons who came to torment St Patrick. This traditional story linked the bell directly to St. Patrick. Also Croagh Patrick, along with Caher Island, was a place of worship on an ancient pilgrimage route winding from County Kerry to County Donegal. Another ancient pilgrimage route leads to Croagh Patrick. It is the Tóchar Phádraig, probably built around 350AD, as the main route from Cruachan (seat of the kings of Connacht) in County Roscommon to Cruachan Aigle, the pagan name for Croagh Patrick. Croagh Patrick Information Centre (teach na Miasa) is situated at the base of the mountain in the picturesqe village of Murrisk opposite the National Famine Monument. The centre is the ideal meeting point for hill walkers, climbers, pilgrims, day trippers and tourists. Facilities provided include showers, safety lockers, restaurant, and general information on the area. The centre is open seven days a week or alternatively you can visit their website.